UPDATE: While President Obama has agreed to pursue a diplomatic solution to punishing President Bashar al-Assad for his alleged use of chemical weapons, he and Secretary Kerry have not entirely ruled out military action. Since Congress's opposition to a proposed strike was key to the administration's decision to back off from their original plan, it is imperative that we keep the pressure on lawmakers to oppose military intervention in Syria. After pressure from Congress and a skeptical public, President Obama announced that he would ask for Congressional authorization before launching military action against Syria in retaliation for President Bashar al-Assad's alleged use of chemical weapons. It's now up to Congress to weigh the many humanitarian and practical arguments against such an attack and to rise to the moral challenge of the moment. In a recently released statement, the International Crisis Group—a leading global think tank and advocacy organization—came out with a strong case against intervention. They wrote: “Quite apart from talk of outrage, deterrence and restoring U.S. credibility, the priority must be the welfare of the Syrian people. 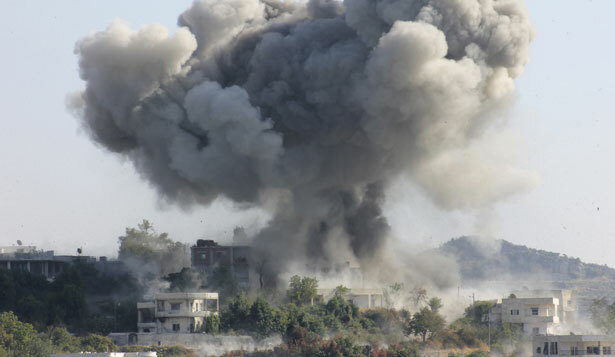 Whether or not military strikes are ordered, this only can be achieved through imposition of a sustained ceasefire and widely accepted political transition.” Military action by the United States would run the risk of killing civilians, would draw the country deeper into an increasingly sectarian civil war and would further complicate attempts at a political solution to the crisis, which has the best chance of ending the violence. The majority of Americans do not want military intervention in Syria and opposition is growing. As Katrina vanden Heuvel writes, "now it is time for democracy to work." Contact your senators and representatives now and demand they say "no" to military intervention in Syria. After completing this action, you will receive periodic updates on articles, events and actions from The Nation magazine. You may unsubscribe at any time. It is absolutely essential that Congress reject the Obama administration's argument for military intervention in Syria. There are both humanitarian and practical reasons to oppose an attack on Syria. If President Bashar al-Assad did in fact use chemical weapons against the people of Syria, the role of enforcing the international norm against the use of such weapons lies with the international community. Furthermore, the use of military force in Syria would run the risk of killing civilians, would draw the country deeper into an increasingly sectarian civil war and would complicate attempts at a political solution to the crisis, which has the best chance of ending the violence. The majority of Americans do not want military intervention in Syria and opposition is growing. I urge you to vote against authorization of military intervention in Syria and to instead support efforts for a political solution and continued humanitarian aid.